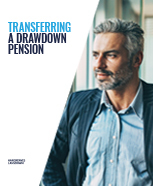 Thinking about transferring your drawdown pension? Cost and service can vary drastically from one drawdown provider to the next. If your provider is falling short of the mark you might be better off transferring elsewhere. Complete your details below. This guide isn't personal advice. This guide is not personal advice. If you’re unsure if an investment is right for you, please seek personal advice. Income is not secure and the value of investments can rise and fall so you could get back less than you originally invest. Before transferring check you won’t lose any valuable benefits or need to pay high exit fees. Thinking about transferring your drawdown pension? Cost and service can vary drastically from one drawdown provider to the next. If your provider is falling short of the mark you might be better off transferring elsewhere.